The WordPress SEO Tutorial Home Page Archives article is part of a series of SEO tutorials to support the Stallion WordPress SEO Plugin and the Stallion Responsive WordPress SEO Theme. This WordPress SEO tutorial covers the Stallion WordPress SEO Plugin – WordPress Home Page Archives options and some Stallion Responsive Theme features related to Home page archives. Under the Stallion WordPress SEO Plugin Options : Not Index Options Tab – WordPress Home Page Archives. Index Home Paged Archives – Completely SEO safe, it’s the default WordPress behavior, if you are in any doubt about not indexing homepage archives, use this option. When this option is set the Stallion WordPress SEO Plugin does nothing to home page archives. Index Home Page Only : Block Paged 2,3,4…^^ – This is safe SEO wise for most WordPress sites, this is the best option. When this option is set the Stallion WordPress SEO Plugin adds a canonical URL to the home page archives first page (the home page) on all paged home page archives. The first page of home page archives (usually the home page) will be spidered and indexed by Google. Home page archive pages 2, 3, 4 etc… will be spidered, but not indexed by Google. Most of the SEO link benefit from home page archive pages 2, 3, 4 etc… will be recycled back to home page archive page 1 (the pages that’s indexed in Google: usually the home page). 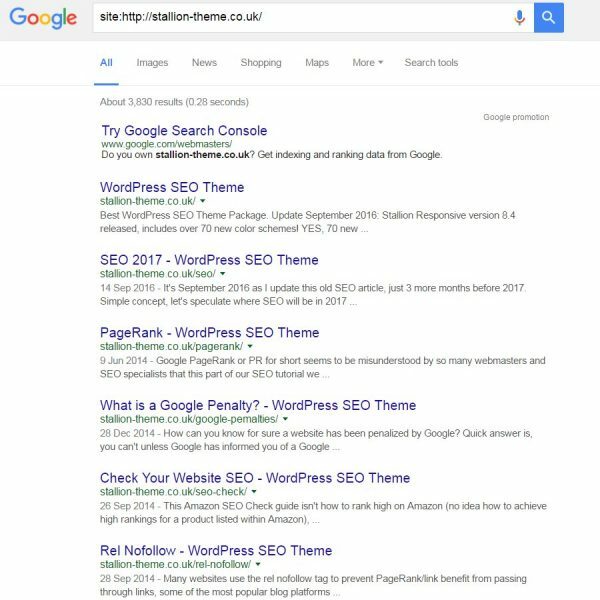 The SEO benefit of this is most of the ranking benefit is concentrated on the first page of a set of home page archives, the first page is more likely to rank for any SERPs it targets. This feature works no matter what options are set under “Settings” > “Reading” : “Front page displays”. There’s two version of the Home Page Archives, on the actual WordPress Home Page (wherever WordPress is installed, usually the root of the domain at example.tld/) and the “Posts page” version (a WordPress Static Page which replaces the Home Page Archives at example.tld/post-page-name/) set under “Settings” > “Reading” : “Front page displays” : “A static page” – “Posts page:”. This results in the WordPress Home Page Archives displaying the latest X number of Posts on the Home Page. 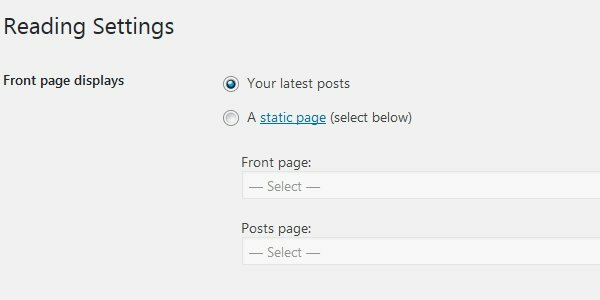 X is whatever number of Posts is set at “Settings” > “Reading” : “Blog pages show at most” – default is the latest 10 Posts. When the Home Page Archives are shown on the WordPress Home Page, the Stallion WordPress SEO Plugin setting Index Home Page Only : Block Paged 2,3,4…^^ resulting canonical URL to the Home Page links to the WordPress Home Page (if WordPress is installed at the root of your domain, your Home Page is at example.tld/). There are no Home Page Archives (there’s just the static front page). Since you now have a Static Front Page instead of the default archived Posts, those links could still load unique content if your Static Front Page uses the NextPage WordPress feature. Because of the existence of the NextPage feature when I created the Stallion WordPress SEO Plugin I couldn’t assume nothing existed at example.tld/page/2/, example.tld/page/3/. There probably won’t be anything at those paginated URLs, but I had to take the possability of those pages existing (couldn’t add a canonical URL to the Home Page from them). 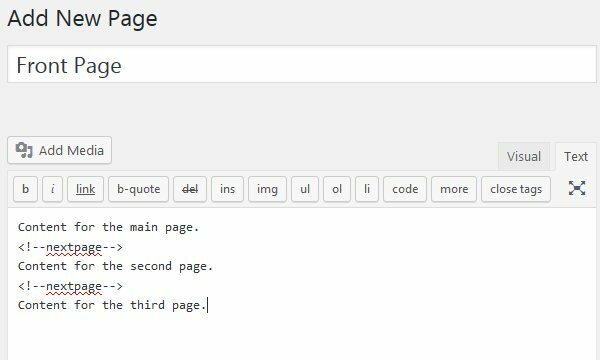 If you aren’t familiar with the NextPage WordPress feature, Posts/Pages can be split into multiple page sets by adding <!–nextpage–> within the content as Page breaks. Content for the main page. Content for the second page. Content for the third page. You’ll see on Page one “Content for the main page.” and below it links to Page 1, Page 2 and 3. The screenshot below is the combined output of page 1, page 2 and page 3 from the Twenty Sixteen theme. 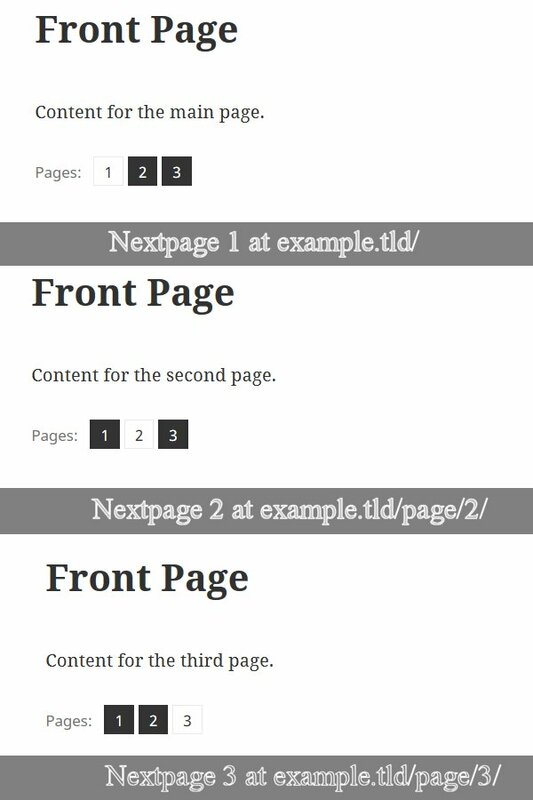 It’s unlikely you’ll be using the NextPage feature on your Static Front Page and even if you did, you’d have to match the same number of paginated pages as you had Home Page Archives. This site has 280ish Posts, so if I had the default 10 posts per Home Page Archive setup I’d have to break my Static Front Page into 28 Paginated Pages using <!–nextpage–> (that would be dumb). If you switch from “Your latest posts” Home Page archives to “A static page” don’t be concerned about the duplicate Front Pages: these will be identical example.tld/, example.tld/page/2/, example.tld/page/3/. Although we’d ideally change the canonical URLs on all the paginated results to the Home page, Google is smart enough to realize example.tld/, example.tld/page/2/, example.tld/page/3/, example.tld/page/4/ are all identical. Real example https://stallion-theme.co.uk/ is the same as https://stallion-theme.co.uk/page/2/. Google will combine the results and since there’s no internal links to the paginated pages, they should drop from the Google index over time. 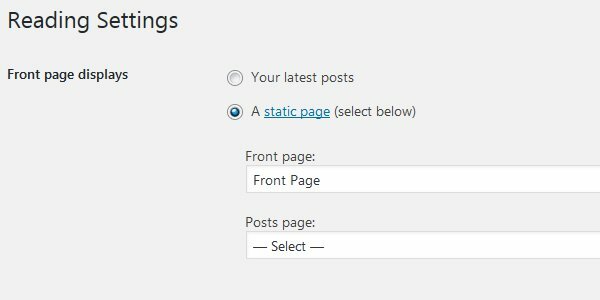 This is like setting “Settings” > “Reading” : “Front page displays” : “Your latest posts”, but the Home Page Archives are moved from the WordPress Home Page to the URL of the Static Page set as “Posts Page:”. In my example screenshot above the Static Pages name is “New Home Page Archives”, so the URL of the Home Page archives is example.tld/new-home-page-archives/ (URL of the Static Page). When the Stallion WordPress SEO Plugin settings Index Home Page Only : Block Paged 2,3,4…^^ is set the resulting canonical URL to the Home Page Archives links to the URL of the Static Page set as “Posts Page:” instead of the WordPress Home page. Should I Use a Home Page Archive? Whether to use a Home Page Archive is up to you, you don’t NEED one from an SEO perspective. On this website I’ve set a Static Front Page and NOT set a “Post Page:” alternative Home Page Archive Static Page. On this site my archives are minimalist (I use the Less is More approach to archives), my SEO strategy revolves around well thought out Categories and some silo SEO widgets (silo SEO widgets are part of the Stallion Responsive theme). Every WordPress Post is added to at least one Category (I rarely add a Post to more than two categories), I haven’t used any dated archives (no monthly or calendar widgets, they are awful SEO wise) or Tags (identical output as categories other than they tend to be one keyword, so waste of link benefit linking to single keyword tags). I also try to manually link relevant webpages together, but I’m lazy, would rather automate it with the silo SEO widgets and other Stallion Responsive SEO features. Most of the indexed webpages will be comments with just one link from a WordPress Post, that’s all Google needs to find, spider and keep a unique webpage indexed. So do you need a Home Page Archive? Not really, BUT if you struggle with understanding internal linking having a Home Page Archive can be viewed as a backup sitemap, a last resort for all your WordPress Posts to be spidered from. 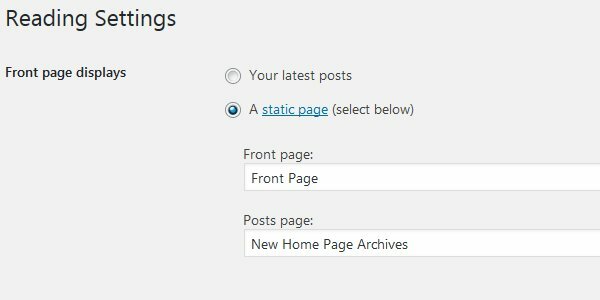 A Home Page Archive whether on the WordPress Home Page or another Static Post has no SEO ranking value beyond the first page. 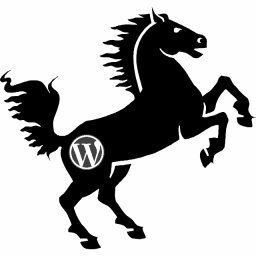 I would therefore recommend always setting the Stallion WordPress SEO Plugin Options : Not Index Options Tab – WordPress Home Page Archives to “Index Home Page Only : Block Paged 2,3,4…^^”. This will give you the benefit of a backup sitemap and recover most of the link benefit that would be spent ranking Pages 2, 3, 4 etc… onto the first page. Why is There No Ranking Value in Paginated Archives? The reason why there’s no ranking value having pages 2, 3, 4 etc… indexed is because the title tags of the paginated archives aren’t unique enough.. This is what paginated Home Page Archives title tags look like in themes like Twenty Sixteen. Although the title tags are unique, “Page 2”, “Page 3” etc… are not SERPs, search engine users do not search for “Site Name Page 2”, “Site Name Page 3” etc… If anyone searches for your site Name, that’s all they will search for (why Twenty Sixteen adds the Tagline is beyond me! ), so anything beyond the first page is worthless in SEO ranking terms. Best SEO advice is set “Index Home Page Only : Block Paged 2,3,4…^^” and recycle most of the link benefit that would be spent on ranking page 2, 3 etc… back to the first page.